This product is an easy-to-use transdermal patch. It is a topical pain relieve patch which is to be applied to the area with pain. The effects of these patches last up to 12 hours. Patches may be cut into smaller sizes for specific application to affected areas that may be too small for a full patch. Trokies CBD Relief Patch is a Doctor approved patch for muscle aches, back pain, arthritis and joint pain. If you do not want to smoke marijuana or eat edibles, this wonderful CBD patch is a great alternative. This CBD Relief Patch contains 100 percent CBD and no psychoactive substances. 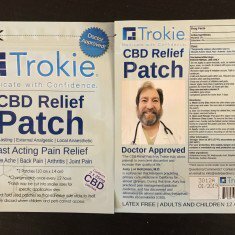 Trokies CBD Relief Patch will also be a great choice for patients who don’t desire the ‘high’ effect some of the other varieties of patches offer. If you need to medicate yourself by treat pain, inflammation or spasms without experiencing psychoactive symptoms, then this CBD patch is the perfect one for you. Other Ingredients: Anhydrous Hemp Oil, Methacrylic Acid, Ethylhexylacryla, Bentonite, and Sodium Stearate.